Back in the mid-1990s, former Federal Reserve Board chairman Alan Greenspan used the phrase “irrational exuberance,” which served as a warning that the stock market may have been overextended. This was around the time of the dot-com bubble and there was increasing worry that investors were piling into tech stocks with no regard for their actual value. It turns out this was indeed a reason to worry. The housing market in the early 2000s mirrored this atmosphere, with everyone and their mother buying houses for the sole purpose of turning a quick profit. If they already owned a home, they were refinancing their mortgage early six months (in serial fashion) and pulling cash out each time they did to purchase Hummers and other luxuries, all the while banking on further home price appreciation to absorb the cost. This was in response to me fretting about the state of the housing market – but she had it fully under control. Because why wouldn’t you refinance every six months, right? Now we’ve come a long way since then, but the housing recovery isn’t exactly equal across every market, this according to new research by Kate Seabaugh, Manager, and Danielle Nguyen, Research Analyst, of John Burns Real Estate Consulting. In fact, as it stands now, one market is still in Phase 1, which is defined as the “cycle bottom/early recovery” stage. This distinction belongs to Chicago, which still can’t seem to shake the housing crisis that took place more than a decade ago. Apparently, home building has yet to take off there, which you’d think would shrink inventory and boost home prices. But the Second City is also dealing with population loss, along with state and local fiscal issues. Then there are the cities in Phase 2, which is the expansion stage, generally defined as stable and gaining traction. This latter phrase is defined by rapid single-family home construction gains and markets that are beginning to heat up, which means they could be poised for big gains. Nearing the end of Phase 2 and also nearing exuberance are places like Atlanta, Charlotte, Los Angeles, and Raleigh. In these cities, normal market conditions persist, but the frenzy has yet to begin. Then we have Phase 3, known as the “early exuberance” stage, which includes the likes of Denver, Orange County, Salt Lake City, and San Diego. In these cities, market conditions are hotter than normal, with above average sales and home price appreciation. It’s being driven by low inventory coupled with firm job growth, which is fueling plenty of demand. The researchers note that San Diego and SLC are particularly hot. Finally, we have the “maturing exuberance” group, which are housing markets that are basically topping out. Unsurprisingly, Austin, Dallas, Manhattan, Nashville, Portland, the Bay Area, and Seattle are part of this group. In these housing markets, you can expect cooling demand as home prices may be a bit overextended thanks to above-average employment and declining affordability. Some of these markets were the first to recover, and are thus beginning to run out of steam. Now the good news. 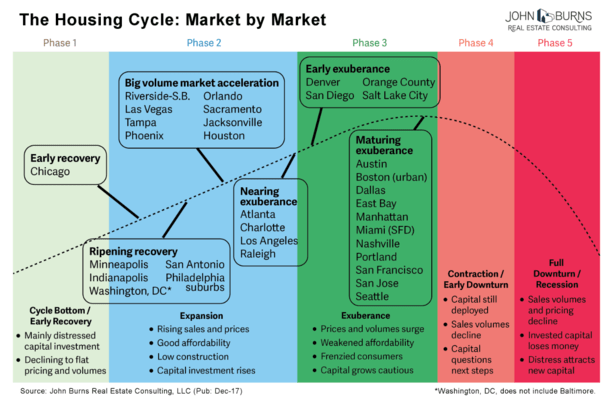 No housing markets have yet to make it into Phase 4 or Phase 5. These are the contraction/early downturn and full downturn/recession stages, respectively. The big question is when one or two markets will enter these latter stages. While it looks like some markets are inching ever closer, we have to remember that this is irrational exuberance. So even though a decline in home prices might be rational, we might not see it play out for many more years to come. In fact, we might not see the next housing crash until 2024, which is a full six years away. 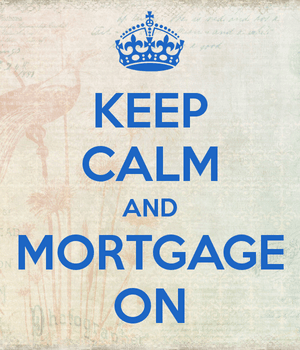 How quickly we get there may depend on how lax mortgage underwriting gets this time around. There is some evidence of loosening, with zero down mortgages and 1% down home loan programs growing more popular. Still, with mortgage rates low and forecast to stay low in 2018, and inventory tight, it’ll take some time to get to that next stage. But we’ve yet to see a return to the fast and loose days of a decade ago. If and when that happens, it might be time to hit the eject button.